Accolade for Agencia after well project. The installation of the well and the testing of the pump by children in Ageno. A charity which collaborates with local communities in East Africa to provide quality education, clean water, health promotion and other community-based projects has acknowledged the support of a family business from East Yorkshire in backing one of its latest ventures. 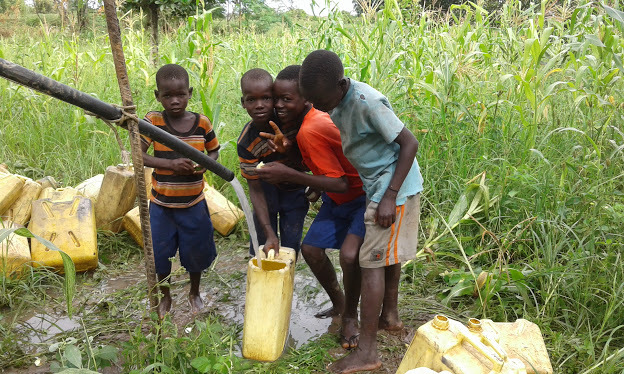 Fields of Life, a UK-based charity which is celebrating its 25th anniversary, has presented a certificate to Hessle-based Agencia to recognise its contribution in funding a well at Ageno Central Primary School in Uganda’s Amolatar province. Agencia, which works to transform lives internationally with its health and justice programmes, made the commitment at the 2017 National Family Business Awards, where the company was named Best Small Business in the UK. The awards event featured a big-money auction which saw bidders splash out on prizes including a spa day, a gin distillery tour and work experience at Fortnum & Mason. Some paid more than £1,000 for a bottle of perfume. But Agencia opted for something literally more down to earth and paid £4,000 to sponsor the well, which is now operational and providing fresh, safe drinking water for 120 households and a total of around 600 people. Since its inception in Ireland in 1993, Fields of Life has raised approximately £30 million, which has allowed the team to build 120 schools, educate more than 50,000 children and drill in excess of 700 wells across East Africa. In the citation which accompanied the certificate, Fields of Life said: “Agencia have a very similar story of transforming organisations for 20 years, and we were delighted to work with them to bring transformation to a community in East Africa. Be the first to comment on "Accolade for Agencia after well project."